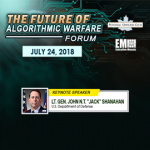 TYSONS CORNER, VA, June 21, 2018 — The Potomac Officers Club — a division of Executive Mosaic — will be hosting the The Future of Algorithmic Warfare Forum on July 24 at 2941 Restaurant in Falls Church, Va. Lt. Gen. John N.T. 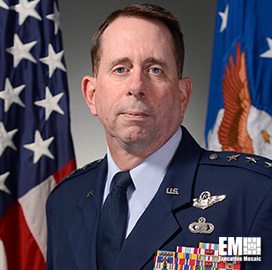 “Jack” Shanahan, Director for Defense Intelligence (Warfighter Support) at the Office of the Under Secretary of Defense for Intelligence at the Defense Department, will serve as the keynote speaker of the event. Information on other speakers will be provided at a later date. Join the Potomac Officers Club to hear public and private sector leaders discuss the future of algorithmic warfare. Keynote Lt. Gen. Jack Shanahan and the panel will discuss Project MAVEN and actionable intelligence, future capabilities of artificial intelligence and machine learning, optimizing clouds for algorithmic warfare and how the industry can help. 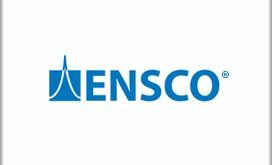 “The Potomac Officers Club invites executives only from the GovCon community to participate in our upcoming forum on the future of algorithmic warfare, where they’ll hear from our panel of speakers about future capabilities in artificial intelligence and machine learning,” said Jim Garrettson, president and CEO of Executive Mosaic. 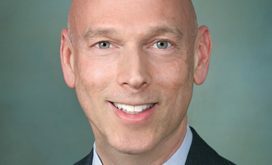 “This is especially important given the threats and ongoing debate surrounding AI military programs such as Project MAVEN,” Garrettson added. The forum will be held on Tuesday, July 24, at 2941 Fairview Park Drive, Falls Church, VA.